Midway personality: concessionaires Herman "Arky" Wood and his wife Bonnie Applegate; and "Tiny, a games concessionaire who works for Midwest Concessions. AIE 2001 Personalities - photos of industry leader participating in the Expo. Manufacturer's Showcase features: Waterloo Tent & Tarp announces promotions and staff additions; Bankshot Organization: non-aggressive family sports; Stealth Fabrication: a new company under the direction of Steve Darvalics formerly of Uni-Glide. An expanded version of the Modeler's Corner offers tips and techniques for building a wide array of pieces suitable for a scale model carnival. Also, monthly features including Midway Talk, Direct From the Lots, and Modeler's Corner and Classified Ads. Funtastic Shows plays the King County Fair, the oldest fair in the state. Texas-based Heart of America Shows is another family-tradition show. The show's route covers 12,000 miles, from Texas through Nebraska. The History of Train Shows ( part XXIV) features the growth of Cetlin and Wilson with the purchase of the North American Exposition equipment; and a profile of Clifford Clarence "Specs" Groscurth. The Canadian show West Coast Amusements Ltd., was started during a time many years ago when animals were highlights of the show. Follow Bingo Hauser and his wife, Jackie, as they travel across Canada and grow a carnival. Do You remember the Grover C. Watkins' Heart Flip? Cars flipped in and out and rotated "rhythmically" like many hearts on the midway! Change is in the air in North Carolina as a result of the retirement of a long-time Commissioner of Agriculture and the election of a new team. Up in the air is the contract for the 2002 state fair, and some insight into the selection process was offered by Bobby McLamb, the new Assistant Commissioner. Deggeller Attractions offered a state fair quality midway at the Martin County (Florida) Fair. One of the newer pieces to the Deggeller midway is the Flashback, a technologically advanced version of the Whip. Terry Portemont's All American Shows run pay-one-price all during their season. No piece on the show is older than eight years old. Manufacturer's Showcase features Gold Medal Products' Candee Fluff containers for cotton candy; and Gorham Fabrications' new Gravity Storm. An editorial comment from Stephen Banks, Butler Amusements and the state of carnivals since September 11, and the continued need for them in the United States. In addition to these interesting and informative articles, catch Direct From the Lots, Midway Talk, Modeler's Corner and classified ads. Coming in December, an expanded Modeler's Corner will offer new pieces being built on scale model midways and construction tips from carnival modelers. It was definitely time to "Twist and Shout" at the Orange County (California) Fair that offered acres of space for the Ray Cammack Shows' midway. Taking advantage of the Florida sunshine, it was Hildeband's Midway of Fun creating their southern route. Do you remember the Chance Manufacturing Rotor - it was like "Look ma no feet!" Creating a fun atmosphere on the midway is T.J.Aho, show artist. Newark, Ohio, will be celebrating its bicentennial next year and has a host of activities planned for the year long event. The History of Train Shows continues to chronicle the decline of the rail shows in the 1940s and 1950s. The 2001 Del Mar (California) Fair fielded an independent midway with three roller coasters. Next year, the fair with a long history and a contest for just about everything, will also sport a new name. Along with an overview of this year's fair are a lot layout and a listing of ride operators and game concessionaires. Smokey Mountain Amusements brought in their Green Unit to Faith, North Carolina to help celebrate the 4th of July. The show also inked a contract extending its run there for another five years. The Central Florida Fair in Orlando is still learning and growing. Wade Shows provided the midway again this year. As the show brings in its third generation, Matt Armstrong Shows is proclaimed to be the Master of Fun. Twentieth Century Independent Midways celebrates George Washington’s birthday in Laredo, Texas – an event that takes over the whole town and runs for several weeks. The History of Trains (part XXI) discusses gilly shows and in particular Cetlin & Wilson shows from the late 1920s. Midway Personality profiles John Gallant, Conklin Shows Guest Relations Manager. Do You Remember Grover C. Watkins Motor Bike ride? Manufacturer’s Showcase covers Sellner Manufacturing and a sweet tie-in to its Tilt-A-Whirl’ s 75th anniversary; the custom designed and manufactured concession trailers by Hitch-hiker Mfg. ; and Gold Medal introduces its Super Floss Maxx to help keep up with the demand for cotton candy. 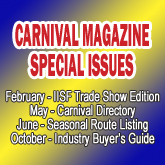 Special insert featuring the route listings of over 35 of the country's finest carnivals. Conklin Shows offers a triple threat -- or a triple treat -- with three portable roller coasters available on their midway. One trailer Himalayas, Gravitrons, go-Gators, -- Wisdom Industries began many years ago as the offshoot of a Colorado carnival focusing on the concept of simpler ride setup and tear down. Management changes bring personnel into new positions and readies Wade Shows for continued growth and prosperity. With a combined outdoor amusement industry experience that spans almost a century, Jack Honeycutt and Jim Elliott have been part of may changes in the business and the two veteran showmen are part of Wade Shows' backbone. The History of Trains follows John Page and his rail show. Do You Remember Wisdom Industries Astro--Liner? The ride that captured the fantasy of spacetravel and adventure is profiled . Plus regular features: Manufacturer's Showcase puts the spotlight on Hitch-Hiker Manufacturing, Sellner Manufacturing, Cutting Edge Creations, and Chance Rides; Who am I - Industry Movers and Shakers, then and now: Midway Talk; Direct >From the Lots; Classified Ads, and Modeler's Corner. The Miami-Dade County (Fla.) celebrated its 50th anniversary with a midway presented by Conklin Shows and featuring rides from a number of other midways including Cumberland Valley Shows. An overview of the history of Conklin Shows demonstrates that it demonstrates a heritage of innovation. Lebanon, Tennessee, is home to the Cumberland Valley Shows, where their facility offers them a place to restore, refurbish and store rides and attractions. Bill Hames Shows is 91 years young and under General Manager Alan Cockerham, is meeting the challenges of the business. Chance Industries has filed for Chapter 11 and is in the process of reorganizing in order to remain a profitable company. They have also signed a letter of intent to merge with D.H.Morgan. a California coaster manufacturer. The History of Train Shows (Pt. XIX) traces the purchase of the Mighty Sheesley Shows by Kortes and Vaught. A trademark of the Sheesley show was their yellow train. Do You Remember the Schiff Tower Slide and the new version by Wisdom Industries? Already taking on the 2001 season, Ray Cammack Shows provided the fun zone at the San Antonio Livestock and Rodeo Show and the Houston Livestock Show. The show has also introduced two new mega spectaculars: La Grande Wheel and the Euroslide.com. Fairs and carnivals attending the Tennessee fair association meeting were treated to a variety of seminars, workshops and attractions to help make the 2001 season profitable for everyone. Part I of the history of Southland Amusements, which is still under the guidance of co-founder Ivene Staunko. Management longevity has been a positive factor for Mighty Thomas Shows. History of Trains, (part XVIII): the story continues with the development and growth of Strates Shows and several other train shows. Manufacturer's Showcase features three new rides from Sartori, Zamperla, and Barbieri, along with a new commemorative blanket from Sellner in honor of the Tilt-A-Whirl's 75th anniversary, and, in time for the hot summer season, Gold Medal's Sno Konette snow cone machine. In addition, look for other regular features in CAROUSEL: Direct From the Lots, Midway Talk, Classified ads and Modeler's Corner. The IISF Trade Show -- great weather and a good time was had by all. See some of the pieces that were on display at the show. Notables at Trade Show -- a great variety of industry personnel came to buy and sell, meet and greet. Matt Armstrong Shows hosts a Fiesta at a mall in N. Little Rock Arkansas, and brought in some of their new rides. Miller Spectacular Show-- this family-owned show has managed to replace most of its older rides with newer ones and has benefitted from continual growth. Blue Monkey Side Show -- combining old traditions in a newer format, the Blue Monkey Side Show offers tradition with a twist. Michigan Convention -- Meetings, seminars, carnival hospitality rooms, it was business combined with a little pleasure that made for a great start for the year. A benefit carnival was held in Gibtown over the holidays to help raise money for the Showmen's Museum. One of the country's largest carnivals, Wade Shows, provided the midway at one of the country's largest state fairs, the Oklahoma State Fair. At the beginning of the season, Wade Shows also provided a midway at the Flagler Dog Track in Florida. Pride of Texas offered a number of rides complementing the midway at the Oklahoma State Fair. The History of Train Shows continues exploring reasons why rail transportation in America became a less feasible means of transport for the carnival industry throughout the middle of the twentieth century. All this plus Who am I?, Midway Talk, Direct From the Lots, and Modeler's Corner. In the January issue of CAROUSEL, the publication takes on a whole new look ! Strong growth with new rides and new dates for Butler Amusements as they end their season at the Big Fresno Fair in California. Coming off a 1999 season that ended with flooding at their winter quarters, Powers Great American Midways has taken on the challenges of the 2000 season and is ready for the rest of the millennium. The Thebault-Blomsness partnership encompasses Astro Amusements and All-Star Amusements. Come along with Astro Amusements to the Illinois State Fair, an event the show has played since 1992. There is a new Stinson Band Organ on the Astro Amusements' midway. The Amusement Industry Expo brought out the leaders of the outdoor industry and CAROUSEL has them captured in action on the show floor. Whether it is north or south of the border, fun at a carnival is still the same. Travel to Mexico to enjoy one of the country's state fairs with a midway provided by three different carnivals. Ontario Amusements is a family-owned show in upstate New York that has carved its niche in playing a number of small dates. Wisdom Industries has introduced a new racking system for the Tilt-A-Whirl. The History of Train Shows follows the continued decline of rail transport for the industry and the increase in truck shows. A one-of-a-kind piece, the Boom Box, was a fun house that traded on looking like the music system of its time. Plus regular features such as Midway Talk, Manufacturer's Showcase, Who am I?, Direct From the Lots, and Modeler's Corner.